Among two concluding branches of the common carotid artery is the internal carotid artery but it is comparatively more straight. It is said to be an upward extension of the common carotid artery. Structures inside the skull and in the orbit are supplied by it. It is the main artery in order to supply the brain and eye. It originates at the plane of the disc in the middle of C3 and C4 vertebrae as the upper margin of the lamina of thyroid cartilage and in order to reach the base of the skull it runs upwards in the petrous temporal bone, where it move in the carotid canal. It arises in the cranial cavity by travelling via the upper part of the foramen lacerum. Before it terminates below the anterior perforated substance of the brain by separating into the anterior and middle cerebral arteries it goes inside the cavernous sinus and follows a twisted path in the cranial cavity. From its origin to the base of the skull it rises up vertically in order to connect the lower end of carotid canal and is located on the front of transverse process of upper cervical vertebrae. The internal carotid artery is bounded in the carotid sheath together with the internal jugular vein as well as vagus nerve in the neck. The lower part of the artery is found in the carotid triangle and is superficial. The upper part is deeply located and found deep towards the posterior belly of digastric muscle, styloid process along with structures attached to it as well as parotid gland. The internal jugular vein is located posterior towards the internal carotid artery at the upper end. At this point the last four cranial nerves i.e. glossopharyngeal, vagus, accessory, and hypoglossal are located in the middle of the internal jugular vein as well as internal carotid artery. The internal carotid artery gives no branches in the neck. In a carotid canal, the internal carotid artery travels inside the petrous part of the temporal bone. It first travels upwards and afterwards turns forwards and medially at the right angle. In order to enter the cranial cavity, it arises at the apex of petrous temporal bone in the posterior wall of foramen lacerum, and travels via its upper portion. Caroticotympanic branches towards middle ear, which anastomose together with the anterior and posterior tympanic arteries. Pterygoid branch (small and inconstant) goes inside the pterygoid canal and anastomoses together with the greater palatine artery. This part is located inside the cavernous sinus. 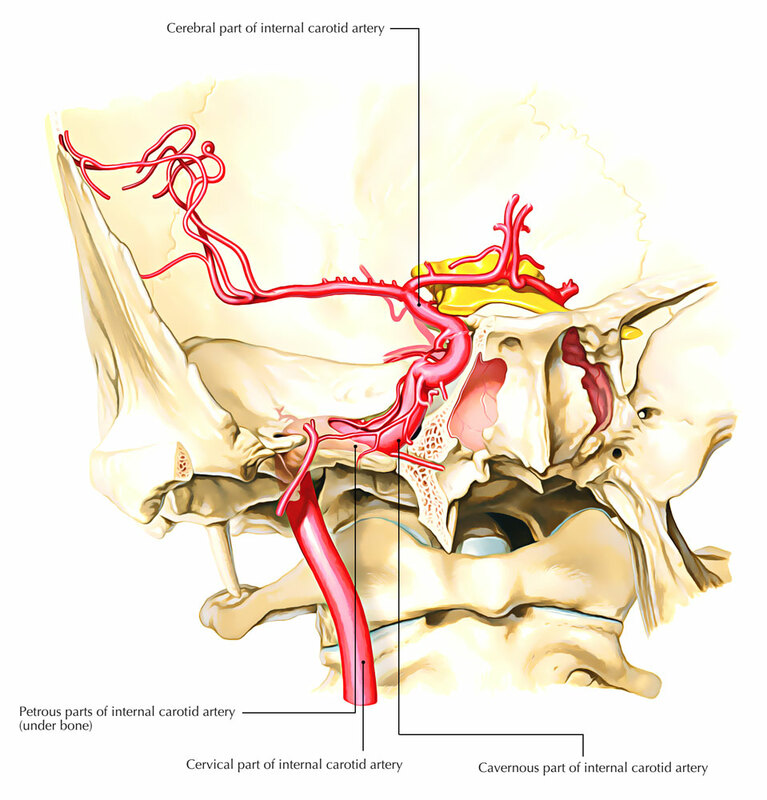 The internal carotid artery ascends from foramen lacerum, and moves inside the cavernous sinus. It travels forward along the side of sella turcica within the floor and medial wall of the sinus. Here it is located outside the endothelial lining of the sinus and inferolaterally associated with the abducent nerve. In the anterior part of the sinus, the artery ascends and pierces the dural roof of the sinus between the anterior and middle clinoid processes in order to reach under the cerebrum. Cavernous branches towards the trigeminal ganglion. Superior and inferior hypophyseal arteries towards the pituitary gland. This portion is located at the base of the brain. The artery turns backwards within the subarachnoid space alongside the roof of the cavernous sinus after arising via the roof of the cavernous sinus, and is found below the optic nerve. Lastly it goes upwards by the side of the optic chiasma and connects with the anterior perforated substance of the brain found at the beginning of the stem of lateral sulcus of the cerebral hemisphere. Here it terminates by separating within anterior as well as middle cerebral arteries. Visual impairment or blindness in the eye on the side of the lesion can be caused Extensive arteriosclerosis of the internal carotid artery in the neck, due to insufficient blood supply via the retinal artery. Due to insufficient blood flow via the middle cerebral artery Motor paralysis and sensory loss likewise occurs on the other side of the body.